I like to play this little game now and then: I’ll pick a word – or as is the case more often, a certain word seems to choose me by rolling around unexpectedly in my mind for several days. At a certain point, feeling unable to ignore it any longer, I will sit down and answer the word’s “call” by writing something about the word’s place in my life. Some words blossom more easily and beautifully than others. I have to confess, this one is somewhat thorny. The best place to start always is the dictionary. What’s funny about “humility” is that the definition I found wasn’t necessarily about what it is, rather about what it isn’t: “not proud or haughty”. Someone who is humble is said to be “ranking low in hierarchy” compared to other people or things. Humility doesn’t come solely from wanting to be humble. In our society, it seems humility is a state of being that you either must consciously pursue or that just happens, not something that a person necessarily achieves. And frankly, Americans in particular and people in general don’t desire humility, anyway. We certainly don’t reward humility that often. During my years as a newspaper sportswriter, I saw this most prevalently in sports, and that hasn’t changed. We have seen grown men putting dangerous drugs (steroids and amphetamines) into their bodies because it’s not enough to be a good, accomplished athlete. Rather, they have to hit the most home runs or set a world record in a race. We have seen college basketball recruiters bend rules, win a lot of games, then leave the program even as the school is punished for the coach’s actions – and the coach doesn’t have any trouble finding a new job. We see athletes and coaches, musicians and actors command more money than seems humanly possible to spend – certainly not necessary to spend. We see politicians compromising what they profess to believe for untold power and rewards. Even as that has happened the last several years, people suffer. The people of the poorest nation in the hemisphere, Haiti, lost what little they had, and in so many cases life itself, in an earthquake. Tragedy and war have ravaged countries in Africa, where the youngest seem to be at greatest risk. Poverty rages all over that continent, as it does in places such as Brazil and Mexico. Children flock from Central American countries to the United States because to stay home means they face a life in gangs or sexual abuse. I still consider it a sad juxtaposition of situations that the earthquake that took countless lives in Haiti occurred the day after Mark McGwire made huge news apologizing for taking performance-enhancing drugs during his baseball career. It happens at all levels of sports. I coached hundreds of basketball, soccer and baseball games at the grade-school level. None of those teams were outstanding, just good. When our teams met an opponent with outstanding talent, often we lost by a big margin. Winning is one thing. Being the best you can be is one thing. But humiliating someone, embarrassing someone, is beyond winning gracefully. There is graceful humility, too. That’s why Pope Francis resonates with the world so profoundly. Like Mother Teresa and St. Pope John Paul II before him, it’s clear that he has poured out himself completely and lives solely for others. We know people like that in our lives. People whose child was born with severe handicaps but who love that child beyond comprehension. People who overcome their early years lived in poverty and achieve great things. People who sincerely apologize for poor decisions. People who serve and never ask to be served in return. Humility. It is never achieved, never a prize awarded for first-class effort. Rather, it happens over time not with a decision alone, but in a way of choosing to live. When we no longer put ourselves first – or even second, third or fourth – then we can be in a humble place. We can have things, but not possess them – better yet, not have them possess us. And when we are in that place, then we can notice God’s presence. 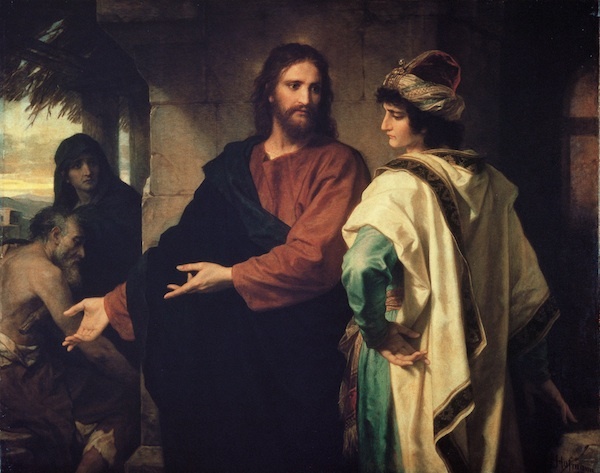 Of course, those familiar with the gospels should remember the dialogue between Jesus and the “rich young man.” The man wanted to follow Jesus. He already was trying to follow the “rules,” the commandments. But when (the man) heard this, he became quite sad, for he was very rich. For the young man, it wasn’t enough to give away things that meant relatively little to him. Rather, if he gave everything to the poor, he would rank lower than them. He no longer could be called a “rich man.” He would be renouncing his very identity. I like to imagine what came next for the young man, though. We don’t hear any more about him, but his fate wasn’t sealed at that point any more than ours is after we make a mistake. My hunch is that the young man’s path crossed that of Jesus again and again. The young man might have kept hearing Jesus’ call over and over and over, his heart torn by what he should do and what he felt comfortable doing. When does God give up on us? When does He stop talking to us, searching for us, loving us? Humility is a constant call to gain a new identity. I like to think that, eventually, the young man answered the call, gave all to the poor and followed Jesus. That means you and I will get a second chance as well. How Did Our Lord Have Humility?